We’re less than two weeks away from the first day of school, I can’t believe the summer is coming to an end! This year, my boys start first and my daughter (who will be in Kindergarten) won’t start for an entire week AFTER they do. She is so excited to finally be in school, I know it will be hard for her to watch her brothers get on the bus without her. So I decided to make a special countdown for 6 days leading up to her first day of school! 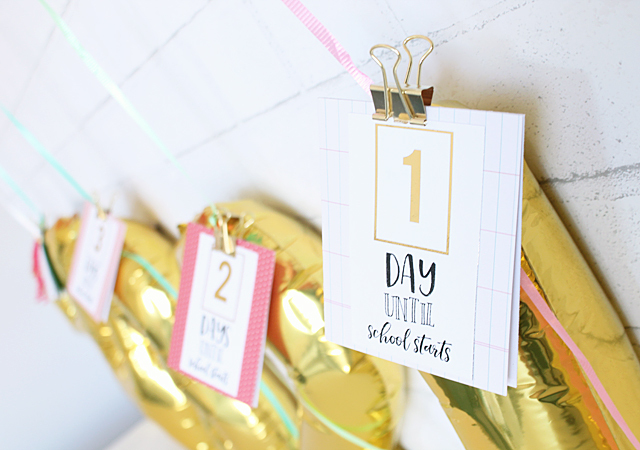 Each day I will give her a balloon with a countdown card attached, and a note inside telling her what we will do together that day. Some days there will be a small gift or item related to our activity, other days it will just be doing something together. I’m starting this as a special tradition for the new kindergartners in our family, but you could totally do it for all your kids together! 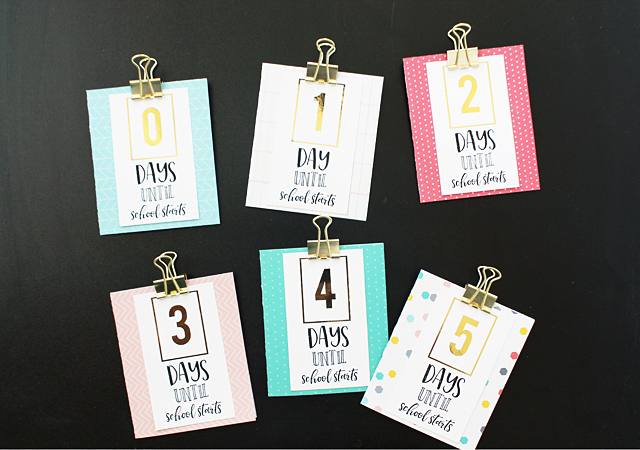 First, I’ll tell you how I made the cards (I have the FREE printables for you) and then I will share some of the ideas we’ll do each day of the countdown. 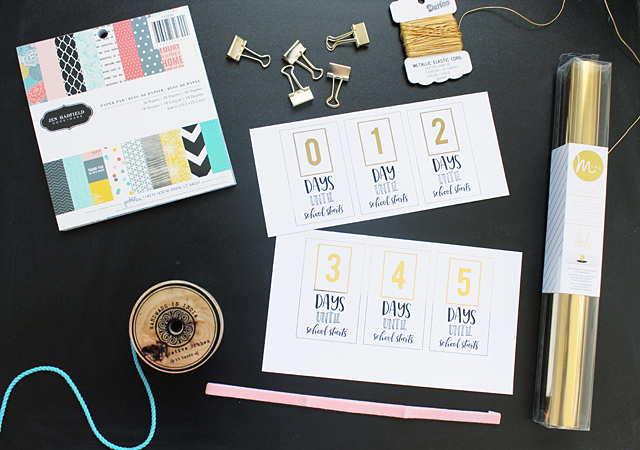 Let’s start with these cute back to school countdown tags! I printed the tags out on my favorite laser printer, then added gold foil to the top half of the tags with my Minc machine. It was pretty easy, I cut the sheet of tags in half (as shown in the picture) and cut a thin strip of gold foil to cover just the numbers at the top. After they went through my Minc, I finished trimming each individual tag. I made some quick cards with Jen Hadfield’s awesome Home + Made paper line, glued the tags on front, and added a gold paper clip for some extra shine! 5 days – Go on a tour of the school and familiarize your child with where things are… her classroom, bathrooms, front office, etc. 4 days – Go school supply shopping. Make it a fun outing together! 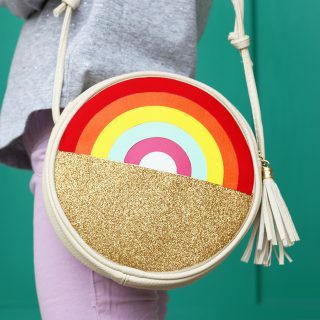 3 days – Have a mini fashion show and let your child try on some of her new school outfits and model them on a “runway” (a line of beach towels will be perfect!) 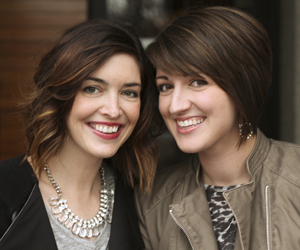 Make it more fun by doing a special hairdo, nails, maybe even a little makeup! 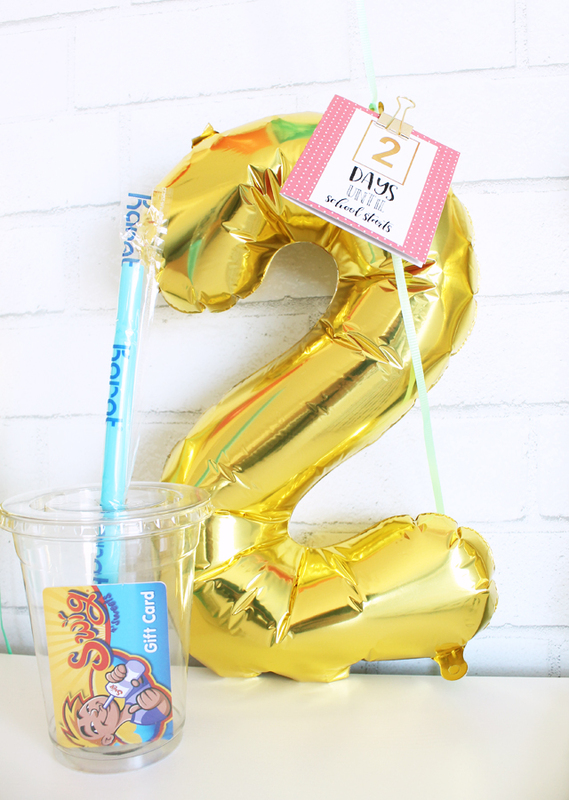 2 days – Take her on a date to one of her favorite places to get a treat. We’re going to SWIG to get sodas and cookies! 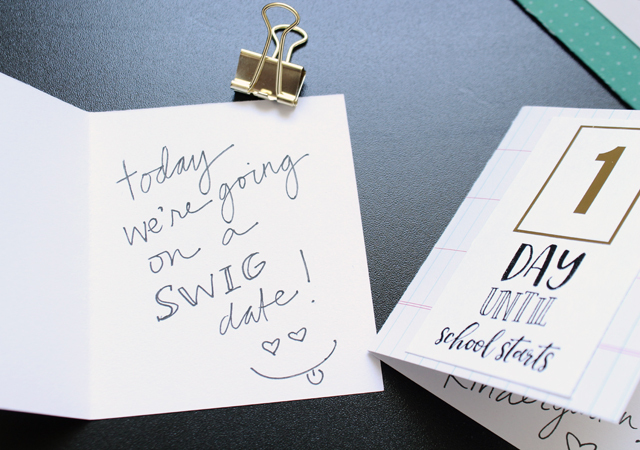 0 days left (first day of school) – Send her off with a note from you and something to make her feel special. For my daughter, I’m going to surprise her with fresh flowers. She always asks if we can get flowers every time we go to Costco or SAM’s Club, but I tell her that flowers are for special occasions. I can’t wait to see her face when she has her very own bouquet! 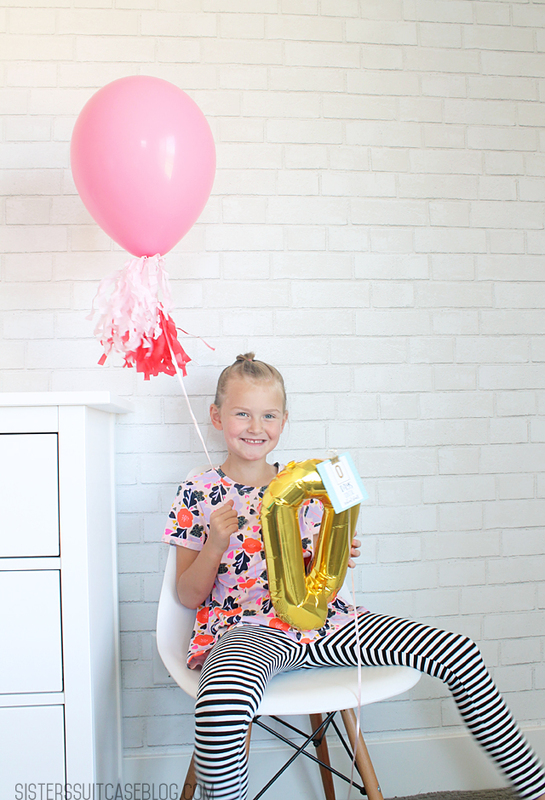 They look cute for the photo shoot, but helium balloons aren’t very practical when you will be giving one each day for a week. 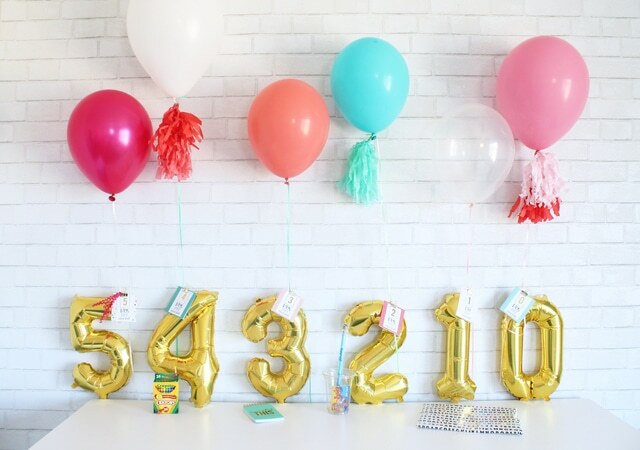 These 16″ gold number balloons are a perfect solution! 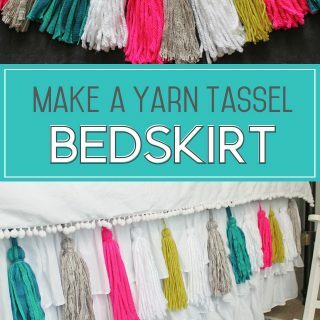 They blow up with a straw and self-seal, so you can reuse them for other occasions! I got mine at the cutest local stationery and party store called Paper Crush. For any Utah county locals, it is in Lehi on Main Street, and I’m pretty sure you won’t leave there without buying something! I’m sure you could find them at most large party stores too. I just love how they go with each day of the countdown. You can totally adapt this concept to anything you want to do to count down to the first day of school. It can be simple activities, a small treat, special breakfast… just do what works in your family! I can’t wait to surprise her with this!